Having problems recycling your metal within the EC London area? We at EC Waste Services provide affordable and outstanding collection service for any unwanted scrap metal. We understand that you may not be aware of or certain of the best price for scrap metal removal services so we endeavour to give you the best price for your scrap metal removal service. We will give you a reasonable and affordable removal price while providing you with the best service. Our aim is to offer the best competitive scrap metal removal prices and also commit to customer satisfaction by providing a top quality service; we provide all the necessary paper work that is involved with the process and deal with it efficiently but quickly. At EC Waste Services we strive to provide a competitive price for the removal of various types of metal. 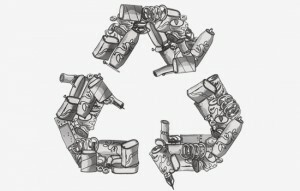 We recycle what is possible, we collect both ferrous metal and non-ferrous metal. Ferrous metals is one of the most recycled materials in the world and is recycled with steel. It contains a considerable amount of iron and the addition of carbon and other substances that creates steel. Non-ferrous metal is any metal that does not contain considerable amount of iron and is generally more expensive than ferrous metal due to the desirable properties that may have low weight, higher conductivity or non-magnetic property. ← Where does all your waste that is collected by EC Waste services go to?